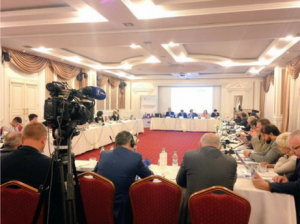 On 19-20 September 2016 the Eastern Partnership Civil Society Forum (EaP CSF) and its Moldovan National Platform organized the conference “On the frontline: human rights situation in the EaP countries”. The event brought together around 50 human rights experts from the EU and EaP civil society community, major international NGOs, EU institutions and the Council of Europe. The Conference was opened by the Moldovan National Platform Coordinator, Ion Manole, Ombudsman of Moldova, Mihail Cotorobai, and the Head of the EU Delegation to Moldova, Pirkka Tapiola. The two-day event included panel discussions that focused on international mechanisms addressing human rights challenges in the EaP countries, best practices for human rights defenders, as well as human rights monitoring and protection in conflict zones. Olena Petsun, Advisor to the Council of Europe Commissioner for Human Rights, and Elisabeth Edland from European External Action Service along with Timur Onica (European Endowment for Democracy) and Hovsep Khursudyan (EaP CSF Steering Commitee Member) provided the analysis of the issues concerning human rights in the region and relevant international instruments. The second panel was composed of experts from the EU Human Rights Defenders Mechanism, Front Line Defenders and Civil Rights Defenders. Hennadiy Afanasyev, a former political prisoner arrested by Russian authorities for openly opposing the annexation of Crimea by Russia, described his experience in the Russian prison and his current activity as a human rights activist. In the third panel, Jean-Marie Rogue (International Federation for Human Rights) together with the activists from the EaP countries discussed possible approaches towards the monitoring and protection of human rights in conflict zones. 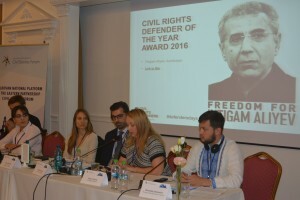 The panel presentations were followed by the workshops that covered such topics as the ECHR practice, human rights education, legal framework of CSOs activity, media freedom and monitoring missions as a new format of the EaP CSF work. During these workshops participants developed recommendations for future actions in tackling human rights abuses in the EaP countries.